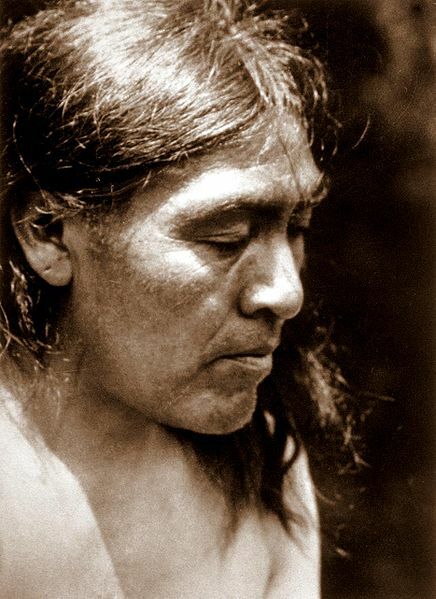 On this date in 1911 Ishi (c. 1860 – March 25, 1916) — supposedly the last full-blooded member of the indigenous Yahi — emerged from his ancestral homeland, in present-day Tehama County, near the foothills of Lassen Peak, and known to Ishi as Wa ganu p’a. He was about 49 years old, and had lived all of his life to that point with a dwindling band of Yahi (and related peoples). With the deaths of his mother and sister he was completely alone and ultimately could not survive by himself. Ishi means “man” in the Yana language. The anthropologist Alfred Kroeber gave this name to him because it was rude to ask a Yahi his name. Ishi is quoted as saying, “I have [no name], because there were no people to name me.” I am given to doubt this. Naming among most indigenous peoples of North and South America is a very serious business. Kroeber’s wife, Theodora, wrote, “A California Indian almost never speaks his own name, using it but rarely with those who already know it, and he would never tell it in reply to a direct question.” So it is more likely that Ishi knew his name but would not reveal it. The only people who could speak his name were dead. But this is not the only mystery about Ishi by any means. Prior to the California Gold Rush of 1848–1855, the Yahi population numbered approximately 400 in California, but the total Yana (of which the Yahi were a sub-group) numbered about 3,000. The gold rush brought tens of thousands of miners and settlers to northern California, putting pressure on native populations. Gold mining damaged water supplies and killed fish; the deer left or were overhunted by miners. In addition the settlers brought diseases, such as smallpox and measles, which the Yana had no immunity to. The northern Yana were wiped out completely, and the central and southern groups including the Yahi were drastically reduced in numbers. While searching for food, they came into conflict with settlers, leading to outright massacres, or bounties on the native peoples by the settlers. A settler could get up to $5 per head he produced. This practice was by no means confined to California, and is a deplorable chapter in the history of North and South America that rarely makes it to the history books. Ishi is estimated to have been born between 1860 and 1862. In 1865, when he was a young boy, Ishi and his family were attacked in the Three Knolls Massacre, in which 40 Yahi were killed. Approximately 30 survived to escape, but shortly afterwards, cattlemen killed about half of the survivors. The last survivors, including Ishi and his family, went into hiding for the next 40 years, and the Yahi were believed to be extinct. From 1859 to 1911, Ishi’s remote band became more of a mix of neighboring groups such as the Wintun, Nomlaki, and Pit River as the populations of all these groups dwindled to the point where they could not sustain themselves as distinct entities. In late 1908, a group of surveyors came across a camp they reported as inhabited by a man, a young girl, and an elderly native woman (and possibly one other person). This was Ishi, his younger sister, and his elderly mother, respectively. The former two fled while the latter hid herself in blankets to avoid detection, because she was sick and unable to flee. The surveyors ransacked the camp and took everything. University of California anthropologists tried to find the camp, but were unsuccessful. Ishi’s mother and sister died shortly afterwards. Ishi lived three years beyond the raid in complete isolation. Finally, starving and with nowhere to go, at the age of about 49 on August 29, 1911, he was found by butchers outside a slaughterhouse near Oroville, and was presumed to be trying to steal meat. Initially, he was jailed by the Butte County sheriff, but U.C. Berkeley anthropologists, Alfred Kroeber and Thomas Talbot Waterman, took him to San Francisco and gave him housing at Berkeley Museum of Anthropology where he lived for the remainder of his life. Waterman and Kroeber worked with Ishi closely over the years and interviewed him at length to help them reconstruct Yahi culture. He described family units, naming patterns, and the ceremonies that he knew, but much of the tradition had been lost because there were few older survivors in the group in which he was raised. He identified material items and showed the techniques by which they were made. Ishi provided valuable information on his native dialect of Yana, which was recorded and studied by the linguist Edward Sapir, who had previously done work on the northern dialects. Ishi, having come to live in San Francisco, and having no immunity to Western diseases, was often ill. He was treated by a Professor of Medicine at UCSF, Saxton T. Pope. Pope became close friends with Ishi, and learned from him how to make bows and arrows in traditional fashion. He and Ishi often hunted together. Ishi died of tuberculosis, then an incurable disease, on March 25, 1916. His friends at the university initially had tried to prevent an autopsy on Ishi’s body since the body was to be kept intact according to Yahi tradition. But the doctors at the University of California medical school performed one before Waterman was able to stop it. Ishi’s brain was preserved and the body cremated. 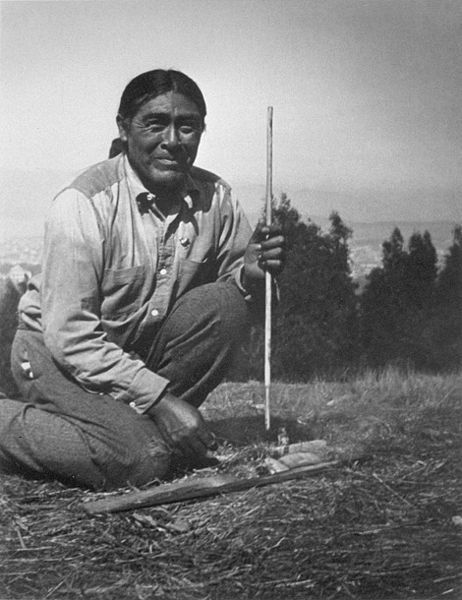 Included alongside his remains were “one of his bows, five arrows, a basket of acorn meal, a boxful of shell bead money, a purse full of tobacco, three rings, and some obsidian flakes.” Ishi’s remains were interred at Mount Olivet Cemetery in Colma, near San Francisco, but his brain was put in a deerskin-wrapped Pueblo pottery jar and sent to the Smithsonian Institution by Kroeber in 1917. It remained there until August 10, 2000, when it was sent to members of the Redding Rancheria and Pit River nations in accord with both the letter and the spirit of the National Museum of the American Indian Act of 1989, that requires the repatriation of human remains to suitable host groups. There is now considerable controversy concerning Ishi’s background. I believe that there is little doubt that he was the last of the indigenous peoples of North America to have lived the bulk of his life without contact with Westerners. The question has more to do with whether he was distinctly Yahi/Yana or of a more multi-ethnic heritage. The flint arrow points he produced, for example, do not resemble Yana examples from archeological assemblages, but look more like those produced by the Nomlaki or Wintu, who were living with the Yana around the time of Ishi’s childhood. It has even been speculated that one of his parents was not Yahi. He spoke Yahi, but possibly his descriptions of Yahi culture are more of a blend of cultures he grew up with. I can’t say I am overly concerned about this given that every culture borrows from others. 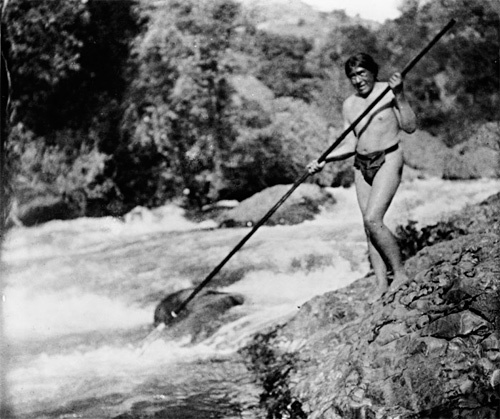 Whatever his origins, Ishi provided early twentieth century anthropologists with a treasure trove of knowledge. 1. Store the acorns several months in a dry place (up to a year). This process can be reduced to a month if they are stored by a fire. 2. Remove the outer skin. 3. Use a grinder or food processor to reduce the acorns to a meal. Depending on usage this can be coarse (for acorn mush), or fine (baked goods). 4. Place the ground acorns in a bag, such as a flour sack, that will allow the passage of water, but not allow the flour to seep out. 5. Put the bag in gently flowing water for 7 to 8 hours (a river is great). A slow trickle from a tap is all right, but the process may take up to 24 hours. Taste the rinse water periodically to see that the bitterness has been removed. The time also depends on the fineness of the flour: the coarser, the longer. 6. Spread the leached flour out on trays in the sun to dry. If you do not want to go to all this trouble it is possible to get acorn flour in some health food stores, or online. Click here for a good source. Here’s the thing. Prepared acorn flour comes from the genus Quercus – the classic oaks – but the peoples of northern California used acorns from the tanoak or tanbark-oak (Notholithocarpus densiflorus), and, to the best of my knowledge, flour from these acorns is not commercially available. It is richer and more flavorful than flour from regular oak acorns, and is what Ishi ate. The simplest recipe is for mush, for which coarser flour is best. 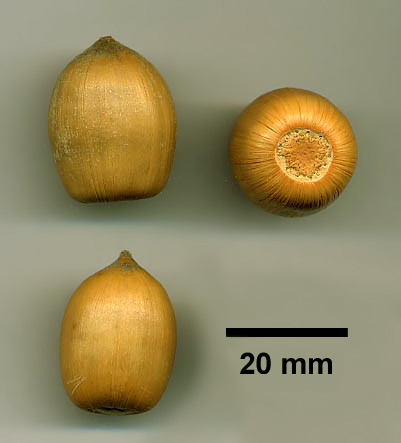 Place a quantity of acorn meal in a non reactive pot (do not use aluminum) with double the quantity of water. Simmer slowly for 1 to 2 hours. The mush should resemble oatmeal or cream of wheat. It can then be used to accompany meat dishes such as hearty stews. 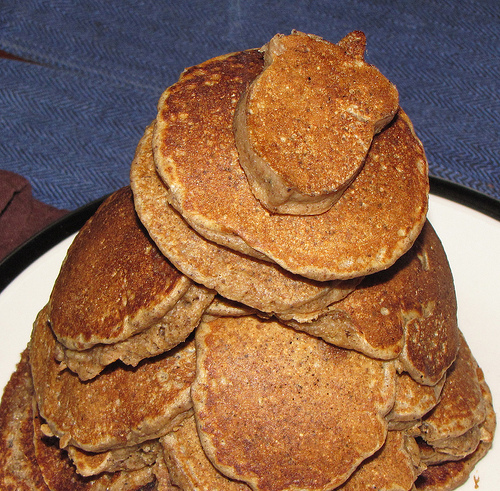 Northern California peoples also made acorn pancakes by taking a very thick mush and using it like a batter, baking it on hot flat stones in a fire. You could do the same with a heavy iron skillet. My efforts in this regard have not been highly successful. The pancakes tended to fall apart and were not especially appealing. What works best is a 50-50 acorn flour and regular flour mix made into a batter with eggs and griddled as you would regular US-style pancakes.